Not every SD card will work well in the GoPro HERO6 Black. Some struggle with its 4K and high-framerate 1080p video modes, especially with Protune turned on. So here are some practical recommendations for cards that work well. 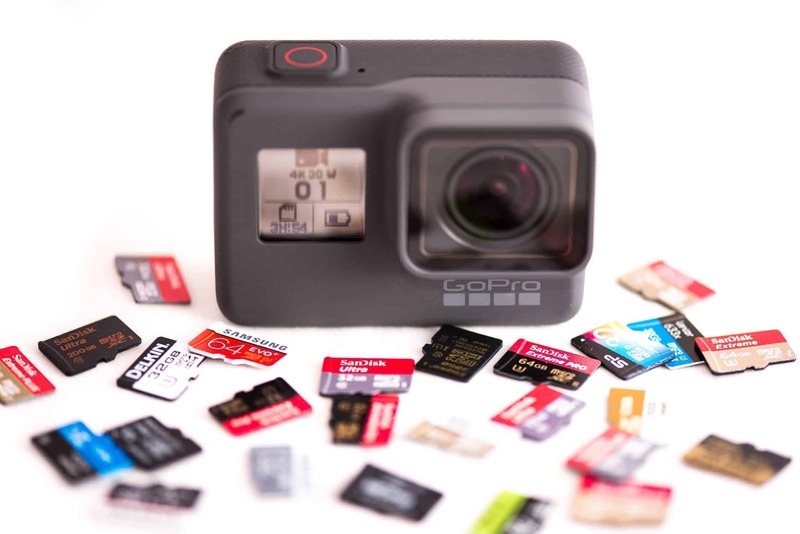 While some retailers put together bundles that might include accessories such as a memory card, GoPros don't come with an SD card as standard. Chances are you'll need to pick one up separately. So here are some practical recommendations for cards that work well even at the HERO6's highest video modes. These SD cards are fast and reliable, cost-effective, and readily available at major retailers. Any of these make for a good choice in the HERO6 Black. If you'd like more detailed recommendations or other brands and models, you can find them below. Why Do You Need a Fast SD Card for the HERO6 Black, Anyway? 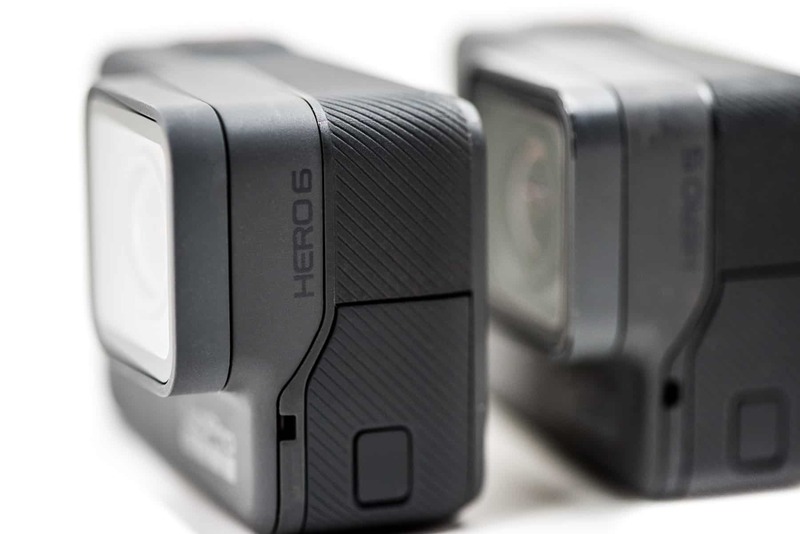 The headline features of the GoPro HERO6 Black are top-end video modes of 4K60 and 1080p240 video. There are also some other upgrades from the HERO5 Black, but it's mainly the new high-end video modes that require a fast SD card. You might have already found this out the hard way if your recordings have been stopping unexpectedly or you've been getting SD card errors. 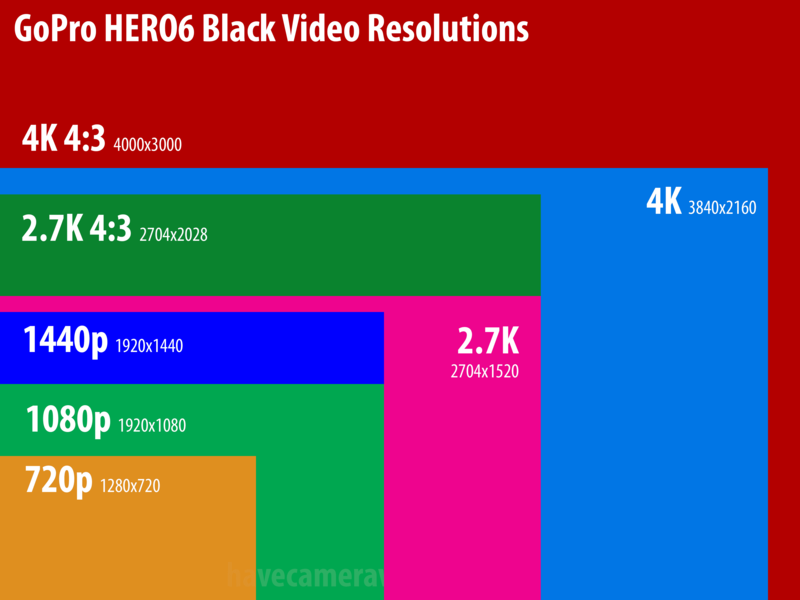 That's because the video bitrates for the HERO6 Black have been bumped up significantly from the ones used on the HERO5 Black. If you want to get technical, the highest bitrate used on the HERO6 Black is now around 78 megabits per second (or Mb/s), quite a bit higher than previous models, and up from 60Mb/s on the HERO5 Black. (I have a table below that details what bitrate is used in which video mode.) And that means that more data has to be written to the memory cards more quickly. The upshot is that not every microSD card will work well in the HERO6 Black. I've also put together some SD card recommendations for the new HERO7 cameras. If you're upgrading from the HERO6 Black to the HERO7 Black, there's some good news: the same memory cards will work in both models. The biggest requirement the HERO6 Black makes of the SD card is that it be fast enough. But it has to be a specific type of fast. That is, memory card manufacturers often put a speed rating on the card that sounds impressive but is referring to the read speed, or the speed at which data can be downloaded from the card. That's not the most relevant measure for using in a GoPro. What you need is a card with a fast write speed, and more specifically a fast sequential write speed. You don't necessarily need the fastest card with bleeding-edge technology--they can sometimes also be ridiculously expensive. But you will need one that's fast enough to keep up with the recording of the HERO6 Black's high-resolution video like the new 4K60 and 1080p240 modes. 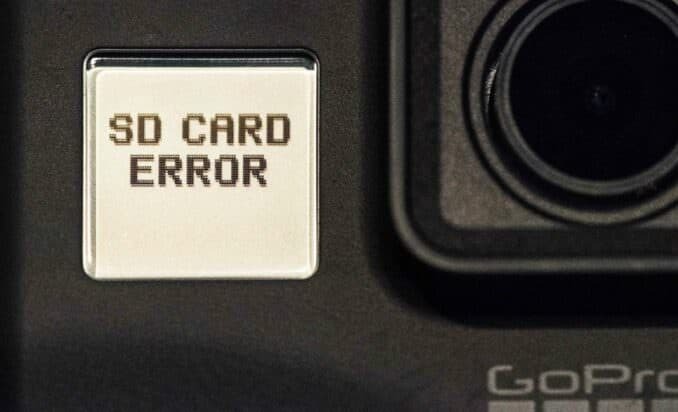 If the card is too slow, the recording can stop, you can get an error message, you can lose footage, or the camera can lock up (and perhaps all of the above). Some memory cards can also provoke write error messages and cause excessive battery drain, although those issues tend to be less common. In general, most of the SD cards that work in the HERO5 Black and HERO5 will also work in the HERO6 Black. Ditto on the SD cards that work in the newer HERO7 Black. But I have run into a couple of cases where even fast cards are having some kind of compatibility issue with the HERO6 Black. In those cases, I've simply left them off the list of recommended cards below. I'm lucky enough to have a lot of the fastest current microSD cards on hand, and I've been testing them in HERO6 Blacks at the highest video modes (with Protune on). This is not designed to be a comprehensive list of every card that works with the GoPro HERO6 Black. What I'm trying to do is present some practical options so you can choose a card and be confident that it's compatible. There are other cards that also work well; I'll update this list as I have a chance to test them or as new models come out. There are also other fast cards that simply aren't easy to find or aren't cost-effective when you do. I'm most interested in ones that are readily available and reasonably priced. There are also cards that I've had problems with, generating error messages like the one below, and I'm simply not including them. What Size, Format, and Rating of SD Card Works Best in the HERO6 Black? The GoPro HERO6 is fully compatible with both the microSDXC and microSDHC specifications (more on that below). This isn't a performance rating. It refers to the formatting system used on the card. You want either UHS-I or UHS-II host specifications. This is marked with either a small I or II on the card. The cameras seem to use the UHS-I host specification, so you won't get added benefits if you put a UHS-II card in them (it will still work but will roll back to UHS-I). Video bitrates are conventionally measured in megabits per second, or Mb/s (or Mbps, with a lower-case "b"). The speed of memory cards is conventionally measured in megabytes per second, or MB/s. There are 8 megabits in 1 megabyte. So 60Mb/s (megabits per second) is equivalent to 7.5 MB/s (megabytes per second). Unfortunately, that's not the end of the story. It would be nice if that meant that you could just make sure your card had a write speed faster than 7.5 MB/s, but other factors come into play in practice, including inflated manufacturer speed ratings, sustained speeds vs peak speeds, and the role of host devices and connections. All of which means that it's best to stick to cards that are known to work. The difference between microSDHC and microSDXC isn't a performance rating. It refers to the kind of storage formatting they use (microSDHC cards use FAT32; microSDXC cards use exFAT). You'll probably never see any practical difference except for one important aspect: microSDHC cards are 32GB or smaller while microSDXC cards are 64GB or larger. The GoPro HERO6 Black is compatible with both the microSDHC and microSDXC formats, so you can use either. microSDHC (Secure Digital High Capacity) is a design specification that refers to SD cards that are between 4GB and 32GB in capacity and formatted with the FAT32 filesystem. FAT32 supports individual files up to a maximum of 4GB. microSDXC (Secure Digital eXtended Capacity) refers to SD cards with a capacity larger than 32GB and with a maximum theoretical limit of 2TB. They're formatted in the exFAT filesystem. 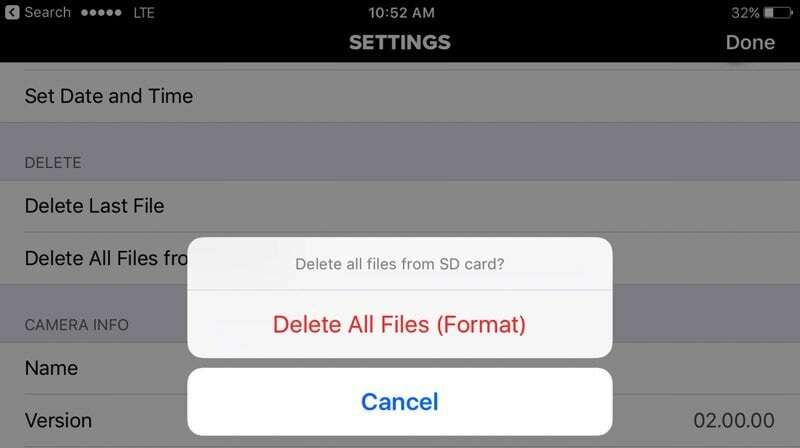 Just like SD cards, microSD cards are assigned a class rating that refers to their speed in writing data. Each category corresponds to a real-world video recording use. These apply the same to microSDHC and microSDXC cards. V90. The V-class is a new designation created to designate cards that are designed to work with the speeds required for 4K video and faster. The SD Association added some lower numbers to make them backward compatible with the older class designations (eg. Class 10 and Class 6), but the most important ones are V30 and above. V60 is applied to cards that support a minimum sequential write speed of 60MB/sec. For now, they're quite rare in the microSD format. V30 is applied to cards that support a minimum sequential write speed of 30MB/sec. 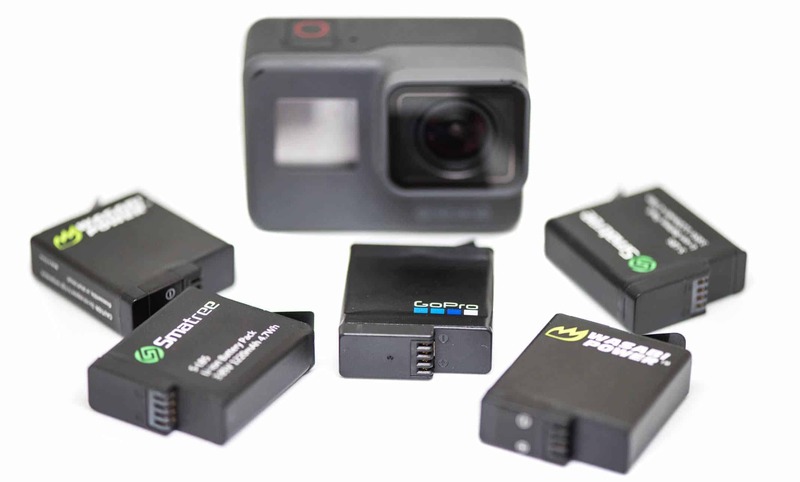 These are designed to support at least full HD video and some 4K video cameras like GoPros. Newer microSDHC and microSDXC cards have a feature called ultra high-speed bus, which refers to the interface. So far, there is UHS-I and UHS-II. Both types of cards will work in the GoPro HERO6 Black, although you won't get any benefit in using a UHS-II card over a UHS-I one. What Size SD Card is Best for the GoPro HERO6 Black? Here are some estimates for the number of photos/footage you can fit on various sizes of memory cards. Please note that these are the estimates provided by the camera's own calculations. While useful as guides, they're definitely not hard and fast numbers. That's especially true of the photo estimates because of the high variability in the file sizes that come out of JPG compression depending on the detail and tones in the photo. (The video estimates tend to be more reliable because while it's done with variable encoding, there's a target average bitrate). You might get more or you might get less. As an example of the variation, I've had times where I've only managed to get about 20,000 JPGs on a 64GB card. So treat the estimates as guides--there's no guarantee you'll get exactly these numbers in real-world shooting. For the video section of this table, you can cross-reference the bitrate (Mbps) rows with the video modes below. As an example, the highest video modes like 4K60 with Protune or 1080ps with Protune record with a target bitrate of around 78 M/ps. If you're recording at 1080p120, it records with a target bitrate of 66 Mb/ps regardless of whether Protune is on or off. You can find the detailed bitrates for specific video modes in the table a little further down this page. Will 128GB and 256GB microSD Cards work in the HERO6 Black? So long as the card has a fast enough write speed and conforms properly to the microSDXC specs, I've not run into any issues using 128GB or 256GB versions. Several of the cards listed above have versions in those sizes that work, and some of the newer ones are even offering versions up to 400GB. Some video modes are more demanding of the speed of the memory card than others. That's specifically because some use a higher bitrate for their recording. The bitrate is a function of the amount of compression used. The less the compression, the higher the bitrate and the higher the potential quality. As you can see from this table, the highest bitrates on the HERO6 Black come into play at the largest/fastest combinations of resolution and framerate and with Protune turned on. I have a more detailed post specifically on the GoPro HERO6 Black video modes here. It's worth buying from a reputable retailer. There are a lot of fake memory cards out there, and buying from a reputable retailer minimizes the risk that you'll be caught out with a fake card that doesn't perform as you expect. Related to that, it's worth sticking to brands with a good reputation. There are some excellent cards from lesser-known manufacturers, but there are also some frankly shoddy cards from no-name manufacturers (or rebranders). I've tried to include a mix of reputable brands in the recommendations above. Another example of a new/less-known brand that makes top-notch microSD cards is someone like ProGrade Digital; their cards will be on the list once they become readily available. Before using it, format the memory card in the camera. It's a safer option that formatting on your computer and can help prevent problems. And it's a good idea to reformat in the camera regularly as a way to prepare the card for use. I do it immediately after downloading all my footage/photos from the card to my computer so that it's ready to go for next time. You can find the reformat function under Settings > Delete All. Obviously, make sure you've backed up or downloaded all the photos and video first. While it's probably still possible to recover photos and video if you've accidentally formatted the card, it's a pain to do so. Don't use the memory card for long-term storage. Download it to a computer, portable hard drive, or to the cloud as soon as practicable (and back that up!). I just want to say thanks. This a fascinating, fact filled article. I had both a Hero3 and a Garmin VirbXE that i sold off and got a Hero6. I had a bunch of Lexar 633x cards that I also parted ways with in favor of the V30 Sandisks (thanks to your insight). Quick question - the V60 Delkin cards are kind of waste of $$ for the Hero6 , but will they become useful with a future Firmware update....or is the V60 speed for a camera yet to be created? It's conceivable that they might unlock higher bitrates with firmware, but I have no inside information on anything like that. HI! Thanks for your time and efforts testing and answering! I am getting Hero 6 and I was intending to buy SanDisk Extreme or Extreme PRO to use with it, but local shop has very good offer for Samsung EVO PLUS 64GB. Would it work fine or should I stick with recommended card? Samsung price is 1/2 of Extreme price, which is 10% less than PRO (Samsung 64GB cost as much as 32GB SanDisk for same declared write speed of 60MBps). Price difference is making me suspicious of Samsung. The EVO+ cards work well, so if you've found a good deal on those, I'd go with that. It's slower than I'd recommend. I'd recommend a faster one like this one. Hello, thanks for the article but because im not into this computer stuff can i ask you if (toshiba microSDXC uhs1 that has 64 gb of space and on the package it also says class 10 and read speed 48mb/s) it will work on new gopro hero 6 black? Im just getting it and i have two of those microsd cards at home already. Appreciate your answer. I, nice article. I have a Toshiba microSD xc1 U3 128 GB and I use with a gph6b. I don't any trouble so far. Is this card good for de gph6b? Several of the cards you recommend list in their specs that they have transfer speeds of up to 80, 90. or 100 MB/s, but have write speeds that are 30 to 60 MB/s. 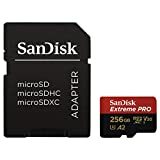 If the Hero 6 requires 80 MB/s to record in the most resource intensive way, how can these cards with low write speeds still be good recommendations? It's the difference between megabits per second (Mbps) and megabytes per second (MB/s). Video bitrates are typically measured in megabits per second, whereas memory card speeds are measured in megabytes per second. There's a more detailed explanation further down the page. I want to buy SanDisk Extreme V30 SD Card. 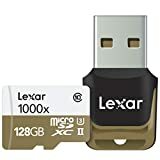 If I buy it on Amazon, will I receive 100% genuine SD Card? Or better to buy it at shop like Argos, Maplin etc? I've bought a lot of memory cards from Amazon over the years and haven't run into a problem with fakes. When possible, I favor ones that are listed as in stock from Amazon themselves over ones from third parties sellers. 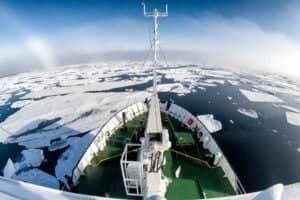 I would like to thank you for this article on the memory cards for the Hero6. I just received one for Christmas and I was wondering which one would work properly with this action cam. I own a Hero (The original!!) and a Contour HD. The Contour would work with a bagel as a memory card, and the Hero was buggy and dropping files with a 32g SanDisk Ultra. Thanks a lot David! All the information provided is very helpful. I'm new to the Gopro game and bought Samsung Evo+ SD cards (64GB) for my new Gopro 6. Do you recommend it? That you for your time! I've found them to work well. You should be all set! I've been using that card in the HERO6 Black and haven't run into any issues. I have both, GoPro Hero 5 Black and GoPro Hero 6 Black. Both works with my Samsung Evo Plus 256GB. Card capacity is recognized correctly by camera and I was able to cover if fully (so far) couple times. So that it was possible to capture over 8 hours in 4K mode. 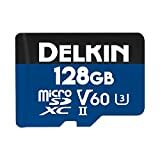 Hi, i can see everywhere references to 32GB cards but is it possible to use the largest size like 256? If yes, would that have an impact on the performance or it will work as well as smaller cards ? I have not personally tried a 256GB card in the HERO6 Black yet, but I've been using 200GB and 128GB without any issues or any performance problems. I know of no reason that a 256GB won't work just as well--they're formatted with the same SDXC / exFAT system--but I just haven't had a chance to actually try it yet. In the Netherlands the SDSQXAF is also widely available, and seems to have the same price as the SDSQXVF. I'm not exactly sure what the difference is (addition of A1?) but it seems to me it is a newer card than the SDSQXVF. Would the SDSQXAF (128 GB) work in the GoPro Hero 6 Black? Yes, the SDSQXAF the current model number sold in most of the world, including Europe. SDSQXVF is the model number in the US and Canada. Both will work well in the HERO6 Black. I really don't know what the difference is between these 3? I see that the A1 is only 90 MB/s read? I'd like to buy the SDSQXAF-128G-GN6MA (https://www.amazon.de/dp/B06XX3X9JD/ref=asc_df_B06XX3X9JD47030540/?tag=pricewatch-21&creative=22662&creativeASIN=B06XX3X9JD&linkCode=df0&language=nl_NL). But I don't know if this is the "slower" A1? The A1 rating is a different type of speed rating that's relevant for running apps from the memory card. It's a separate rating, not one in the same sequence. So it's possible for a card to have both an A1 rating and a V30 rating, for example. The A rating (for apps) incorporates the random read/write speed, which isn't really relevant to recording video or photos (for those, the sequential speed is what matters). If you're recording video (or shooting photos), the speed classes you want to look for are the ones starting with V (eg. V30 or V60) or U (U1 or U3). I've just posted a more detailed explanation of the A1 rating. The short version in this context is that it's not really relevant to GoPros.